Boundless curiosity, close observation and patience are manifest in the gorgeous work of Catherine Latson. 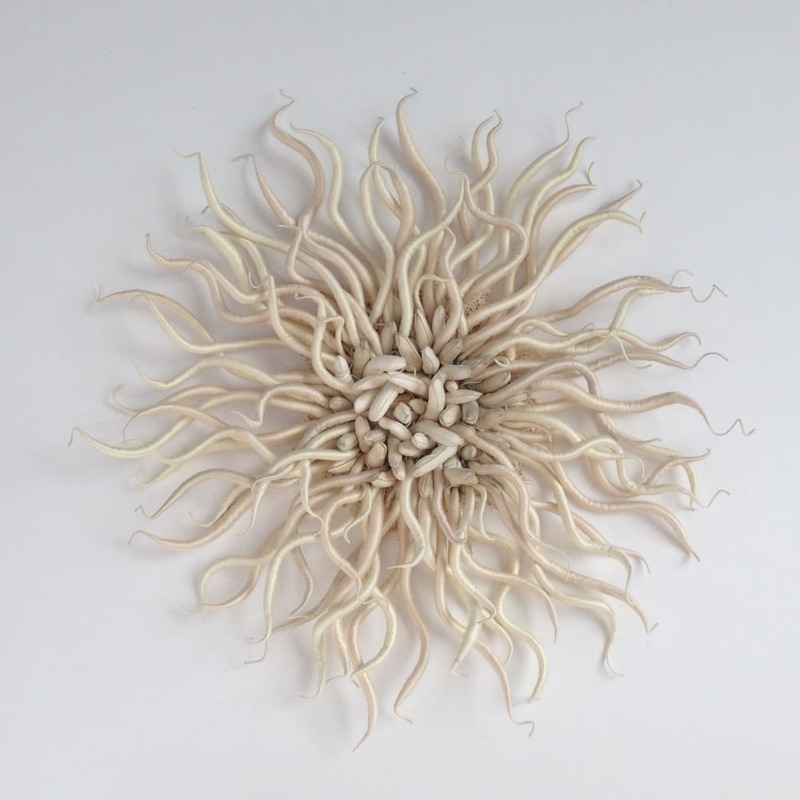 The Specimen Series is inspired by sea anemones and the motion of a water-bound world, exploring forms that blur the lines between animal and plant, realism and fantasy, sculpture and specimen. Radial symmetry and tentacle structures are common denominators in the mysterious variety of forms in Latson’s newest work. Each wall sculpture describes a mysterious, hybridized and imagined organism in arrested motion. Latson’s complex artworks belie her simple materials. The artist hand-dyes embroidery floss in variations of a single dominant color and wraps the thread tightly and skillfully around her armature. The construction of each work entails countless hours of whipping and knotting resulting in dense, rich color and graceful, compelling compositions. Catherine Latson earned a BA in Biology from Macalester College, St Paul, MN. Her work has been exhibited throughout the United States, including at The Hudson River Museum, Yonkers, NY and in the Macy’s Flowers Shows in Philadelphia, PA and New York, NY and has been featured in the American Craft Magazine and The New York Times. The artist works in Yonkers, NY.